London is home to over 300 museums and galleries, making it the epicentre of culture and collections in the northern hemisphere. From the world's largest Maritime Museum to an art gallery in an old power station, London delves into the history of everything from boats to Botticellis and mosaics to manuscripts. Also worth checking out is our London Museums Late Openings article. Over eight million objects from all over the world are housed in this impressive museum of human history and culture (many of the artifacts are stored underneath the museum due to lack of space). Founded in 1753, the British Museum displays ranging from prehistoric to modern times were primarily based on the collections of physician and scientist, Sir Hans Sloane. Notable objects include the Parthenon Marbles, the Rosetta Stone, sculptures from the Parthenon, the Sutton Hoo and Mildenhall treasures, and the Portland Vase. The hieroglyphics and classical sculptures are instantly recognisable and world famous, but more surprising is the workmanship and beauty of the Saxon jewellery collection. The treasures assembled here, from Britain's Dark Ages, reveal a period of original and brilliant artistry. 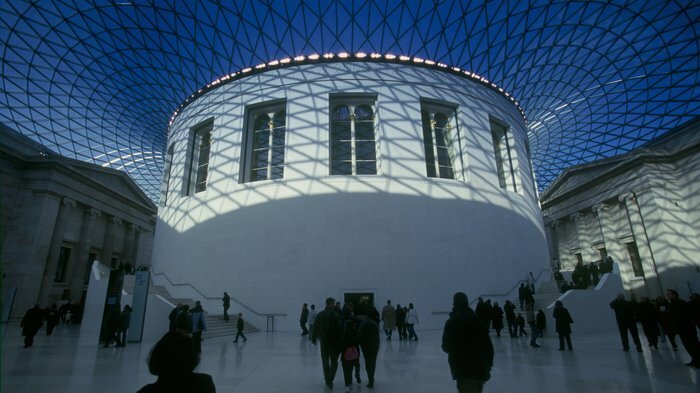 The museum's Great Court with its magnificent glass and steel roof by Sir Norman Foster is an exhibition piece in itself. Regular events include talks, films, performances and demonstrations. The National Gallery dominates London's Trafalgar Square with its neo-classical columns and portico designed by William Wilkins adjoining the square where it has been pedestrianised. Some of the finest examples of European art, ranging from 1260 to 1900, are included among the 2300 paintings filling its halls and rooms. Holbein's 'The Ambassadors', 'The Hay Wain' by Constable, and Jan Van Eyck's 'Arnolfini Marriage' are just some of the major attractions. Works on display also include those of Botticelli, Monet, Constable, Van Gogh and Rembrandt. This really is the place to come for top quality artwork spanning a wide spectrum of styles and periods. From the Early Renaissance to the Post-Impressionists, every significant stage in the development of painting is represented in its collection, often by masterpieces. Originally established by Parliament in 1824, the collection belongs to the British public and every effort is made to encourage the public to visit, view and experience the art: free entry, free events, free talks and free tours support this ethos of encouragement and enthusiasm. Regular activities include: audio tours, guided tours, sessions for visitors with a visual impairment, lunchtime talks, live music and late night openings on Fridays. An 8-metre long giant squid, a walrus from Hudson Bay overstuffed by a London taxidermist in the 1880s, the skeleton of a Triceratops, a life-size Blue Whale and a sea cow are just a few of the 70 million items to call this exciting, interactive, life and earth science museum home. Highlights of the Natural History Museum include: Dinosaurs - the ultimate prehistoric exhibition, Creepy-Crawlies - guaranteed to have you scratching in seconds, Human Biology - the must-see exhibition about the evolution of the species, The Power Within - a sensational earthquake experience, and Ecology and Mammals. Investigate - a hands-on science centre - is especially great for children and kids can also follow gallery trails and try their hand at art activities. The annual Wildlife Photographer of the Year also demands attention and is a highlight of the museum's temporary exhibitions. For those wanting to explore further a visit to The Darwin Centre in its magnificent cocoon building is highly recommended. Regular lectures and demonstrations combined with interactive exhibitions aim to bring to life the millions of preserved specimens on show. There is also a tranquil wildlife garden containing native fauna and flora. Home to one of the world's most magnificent collections of science, industry, technology and medicine, the Science Museum is one of London's most hands-on and interactive museums. Funded by the profits of the Great Exhibition of 1851, it started life in the 19th century as part of Prince Albert's grand scheme to promote industrial technology. Today, it occupies a purpose-built gallery and contains some 300,000 objects, covering the entire history of Western science, technology and medicine. Visitors are invited to learn about forces and motion in Launch Pad and discover how aircrafts are built in the Flight gallery. The Wellcome Wing allows visitors to morph their faces to look older or younger, manipulate their voices and create digital music, or be sucked into the 3D world of the stunning IMAX cinema. The scientific questions of the day are hotly debated in Antenna. This isn't the place to come for serious works of exceptional artistic merit - the overriding aim of this gallery is to reflect the status of the sitter, not the artist - but where else in London could you hope to find The Beatles, Henry VIII, Fatboy Slim and Joan Collins all hanging out together? The appeal of the National Portrait Gallery (opened in 1856) rests simply in its comprehensive commemoration of British history from the late 14th century to the present day through the medium of portraiture. The sense of progression and the feeling of familiarity with many subjects are what make the gallery so appealing. Having said that, critically acclaimed self-portraits by William Hogarth, Sir Joshua Reynolds and other notable British artists are also displayed alongside the 10,000 portraits of everyone from statesmen to showbiz stars and media barons. The collection represents Britain and is arranged thematically, starting with the Tudors and ending with present day politicians and pop stars. Look out for the only surviving portrait of Shakespeare taken from life in The Ondaajte Wing, the Hans Holbein cartoon of Henry VIII, the anamorphic portrait of Edward VI, and the sculpture of Queen Victoria and Prince Albert in medieval costume. Photographs, caricatures, drawings and sculpture are included in the collection which also boasts 250,000 archived images. The National Portrait Gallery also hosts the annual BP Portrait Prize competition alongside ever-changing collections of contemporary work. With over 145 galleries to explore and over 4 million items, the V&A is one of the most influential museums of decorative and applied arts in the world. It was originally founded in 1852, with the aim of enthusing and educating British manufacturers and designers. It is now home to a stunning collection of European, Indian, Chinese, Korean, Japanese and Islamic artefacts ranging from ceramics, glass, metalwork and sculpture to costume, armour, weaponry and furniture. The gallery also houses the national collection of photography. Visitors can delve into the fascinating dress collection that features samples from historical dress to 21st century haute-couture or examine the celebrated Arts and Crafts interiors of the Morris and Gamble Rooms. The gallery is often cited as housing the greatest collection of Italian Renaissance sculpture outside Italy, while the British Galleries - which opened to great acclaim in November 2001 - are unique in their exploration of British design from Chippendale to Morris, Adam to Mackintosh. Highlights include the Great Bed of Ward as mentioned in Shakespeare's 'Twelfth Night', and James II's wedding suit. In recent years the trend at the V & A has been towards style retrospectives of entire periods like Art Deco, Art Nouveau and shows focusing on individual designers like Armani and Ossie Clarke. The museum is second-to-none in this regard. The building itself - a mix of Victorian and Edwardian design - also presents a truly formidable display. The two halls (Cast Courts), in particular, form a major focal point for the gallery - with their high glass roof, elevated corridors and walkways. 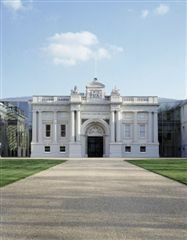 Located in the heart of historic Greenwich, the National Maritime Museum houses the most important collection of objects relating to the history of Britain at sea. The collection, partly housed in former royal palace Queen's House, dates back to 1823 when a National Gallery of Naval Art was established, featuring some 300 portraits, paintings and artefacts. The museum occupies a former asylum and hospital school, and enjoys fantastic views of the Thames from its elevated position. With the addition of the covered Neptune Court, the museum now boasts galleries dealing with topics ranging from navigation, naval exploits and Nelson, to exploration, the ecology of the sea and emigration. Visitors can try their hand at signalling and gunnery, explore the expansion of the Empire or just revel at the power, majesty and romance of the sea through poetry, painting and photography. While you're here leave time to visit the Peter Harrison Planetarium as well as the Meridian line by which time across the globe is measured. Experience the real flavour of London life from the prehistoric to present day at the Museum of London, a modern museum boasting over 1.1 million objects - many rescued from archaeological digs or discovered during building works in The City. A chain of chronological galleries guide visitors through the history of this ancient city; 50,000 objects from Roman London pave the way to buckles, brooches and belt-fittings of the medieval period, 17th century glassware leads onto vivid Victorian street scenes, interiors and shop fronts. From the skulls of those thought to have been massacred by Queen Boudica to boots worn by the Duke of Wellington, Queen Victoria's parliamentary robes and paraphernalia from the Suffragettes' Movement, the history of London and its inhabitants is brought back to life with startling intensity. Don't miss fragments of the old London Wall located just outside the museum. The Turbine Hall, 20th century art, Matisse to Moore. Located along the banks of the River Thames, Tate Modern opened to great acclaim in 2000 and has since welcomed millions of visitors through its imposing doors. If you are visiting for the first time, you should approach from Blackfriars (Tube / Rail) station, crossing Norman Foster's 'Blade of Light' Millennium Bridge, walking towards this spectacular modernist masterpiece with the dome of St Paul's Cathedral behind you. Housed in the former Bankside Power Station, the gallery pays homage to art from 1900 to the present day. The awesome Turbine Hall creates a stunning entrance and a vast space, used to display temporary installations on a grand scale. There are three levels of galleries enclosed by a spectacular two-storey glass roof that provides fantastic views of London and a great cafe. Full of the jokey eccentricities of contemporary art, it's one of the few art galleries that children and teenagers will enjoy, but it also offers the full set of iconic 20th century artists, from Matisse to Moore, Dali to Picasso. Justifiably the most popular art gallery in Europe. Designs that have shaped the modern world from fashion to furniture. In 2016 the Design Museum moved from is long standing home at Shad Thames to a venue three times the size, the former Commonwealth Institute building in Kensington High Street. The Grade II* listed building has been transformed by a design team led by John Pawson to include the Swarovski Foundation Centre for Learning, 202-seat Bakala Auditorium and a dedicated gallery to display its permanent collection, accessible free of charge. Within the collection - which started in 1982 as the pioneering Boilerhouse Project in the V&A - are designs that have shaped the modern world from fashion to furniture, product and graphic design, digital media, transport and architecture. The collections, both permanent and temporary, trace the history of design developments, from the origins of mass production to contemporary works. Designed in a distinctive Arts and Crafts architecture style by Charles Harrison Townsend, the Whitechapel, Britain's first purpose-built arts gallery, is renowned both for the beauty of its light, airy space and for embracing the local community in its work. Founded in 1901, extensive refurbishment saw the gallery, reopened in April 2009, double in size. The gallery does not have a permanent collection, preferring instead to host a constantly evolving programme of works and there is always something free to see. Community projects and retrospective exhibitions now rest alongside landmark examples of contemporary work. The Pop Art 'This is Tomorrow' exhibition of 1956 is often hailed as the gallery's most iconic event, although there are a number of other exhibitions worthy of note. Picasso's 'Guernica' was displayed here in 1938, Jackson Pollock had work exhibited at the gallery in the 1950s, David Hockney's first show was held here in 1970 and Lucian Freud had a major exhibition in 1993. With its pillared supports and high ceilings, The Lower Gallery, in particular, is a fantastic exhibition space. The expansion means the Whitechapel has a number of new exhibition spaces offering a fantastic backdrop for corporate and private events. The national museum of war and wartime life from 1914 to the present day. The IWM London, the flagship Imperial War Museum which offers a thoughtful look at what day-to-day life is like for both citizens and soldiers in times of conflict, re-opened on 19th July 2014 with a dramatic new atrium space by Fosters Partners, and new permanent First World War Galleries, a highlight of which is a trench complete with periscopes, sounds and projections recreating what life was like behind the front line on the Western Front. Entering the museum, visitors see 'Witnesses to War', nine iconic objects including a Harrier, Spitfire and V2 rocket suspended from the ceiling. Level 1 of the transformed space presents 'Turning Points: 1934-1945' with key stories from the Second World War. 'Peace and Security' on level 2 explores contemporary conflicts from 1945 through to present day while 'Curiosities of War' on level 3 presents some of the more obscure objects in the museum's collections including a bar where the dambusters crew used to drink, and a sofa which troops in Afghanistan made out of hesco fencing. From cheap budget accommodation to luxury 5 star hotels see our special offers for hotels, including Hilton London Hyde Park Hotel from 67% off.